This post is the first in a series that will detail each plant I’m growing with pictures from seedling to vegetable! Think of it as my online notebook of each variety. I decided to post these because I know during the cold snowy winter when I researched “what to grow” I loved looking at pictures of how things grew and what their quirks were. This post will be continually updated with pictures and information as I learn, and as the plants grow! Description (from packet): The sweet, fine textured flesh of this high-quality, all purpose variety make it one of the best for pie making and for canning. The round, bright-orange fruits average 7 pounds with few seeds. Also ideal for carving. 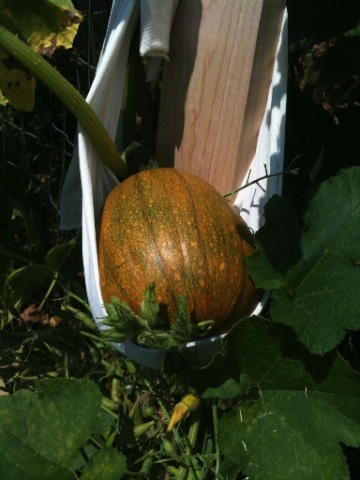 Why I’m growing them: Hopefully for pumpkin pie and to can some pumpkin puree if we get that many. Related Children’s Books: We have really enjoyed Wendy Pfeffer’s From Seed To Pumpkin. 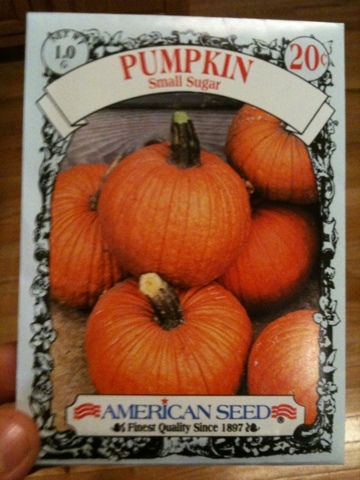 The pumpkin seeds came from either Farm and Fleet or Walmart. I can’t remember. These were an afterthought. I hadn’t planned on growing them but I had a space to fill and it seemed like a fun thing to try. 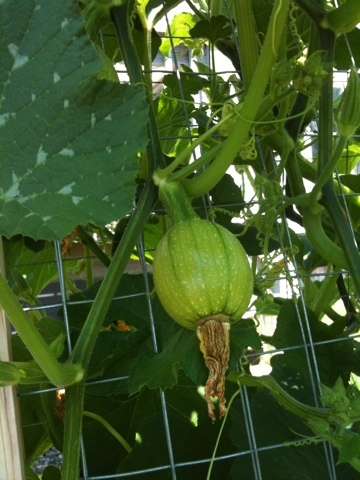 First thing to note – I planted them about 6 inches apart at the bottom of the trellis. 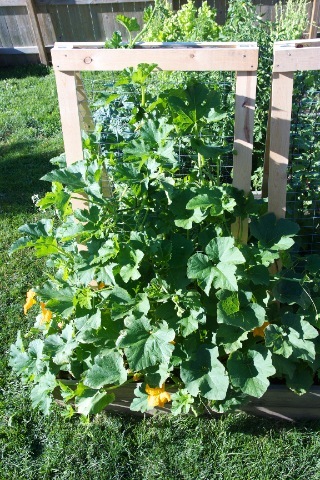 I think I could have spaced them a lot more as they are so thick now (early July) they have taken over their trellis, the other side of their trellis (which is ok because beans that were supposed to be pole beans there are clearly bush and aren’t using the trellis) and they are trying to take over the cuke trellis next to them. Here they are, starting to take off. They quickly took off up the trellis once they reached it. I did do some repositioning here and there, weaving the vines into the trellis for support. 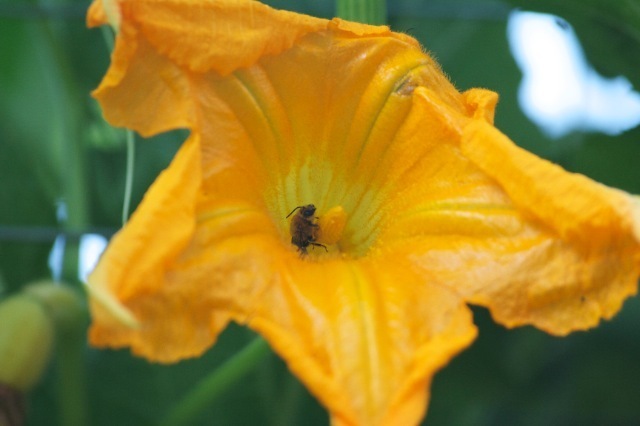 Before the pumpkins will grow, the female flowers (attached to the tiny pumpkins) need to be pollinated. My understanding is that this is done by bees and insects landing on the male flowers (on the long thin stems) and then landing on the female flowers and transmitting the pollen. The flowers seem to be open the most first thing in the morning and the bees buzz all around them then. 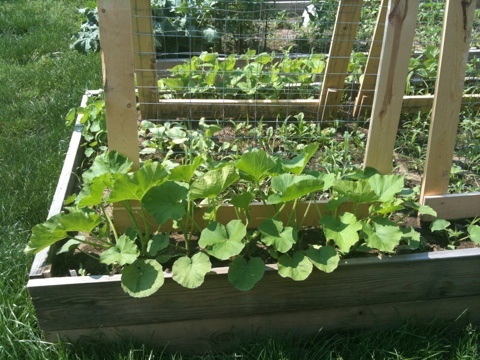 Here are a few of the pumpkins starting to grow. 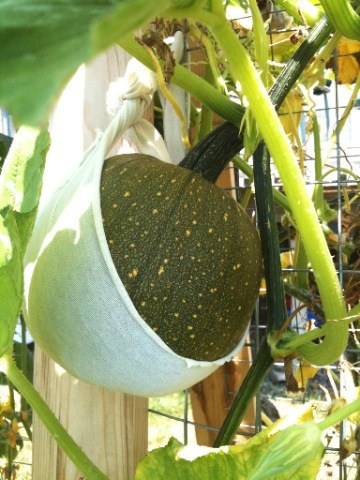 Once the pumpkins start to get a little heavy for the vines, I tie them to the trellis in a sling made of strips of old t-shirts. 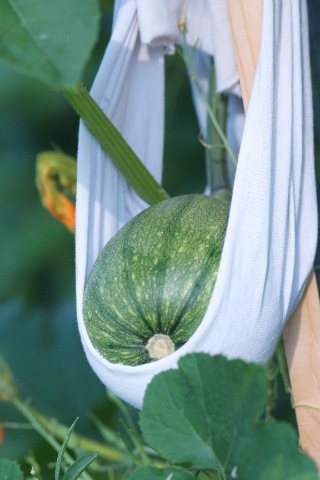 I’m assuming that as they grow the slings may need a little adjustment but they are working great right now! I can’t wait to come back and update when they get bigger and start turning orange! 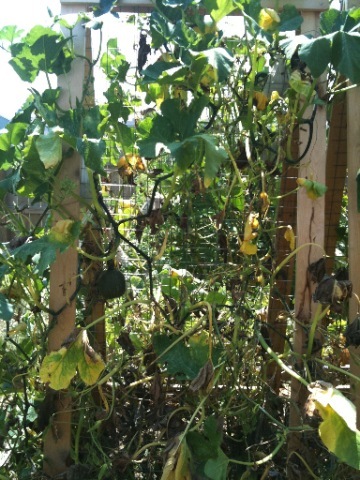 July 22nd Update – The pumpkin vines are starting to die back. I don’t know for sure but I don’t think that’s normal. It may be the relentless 100+ degree heat wave we’ve had. I have been watering them. On a hopefully positive note the pumpkins have changed from light green to dark green and are starting to show orange-ish color. 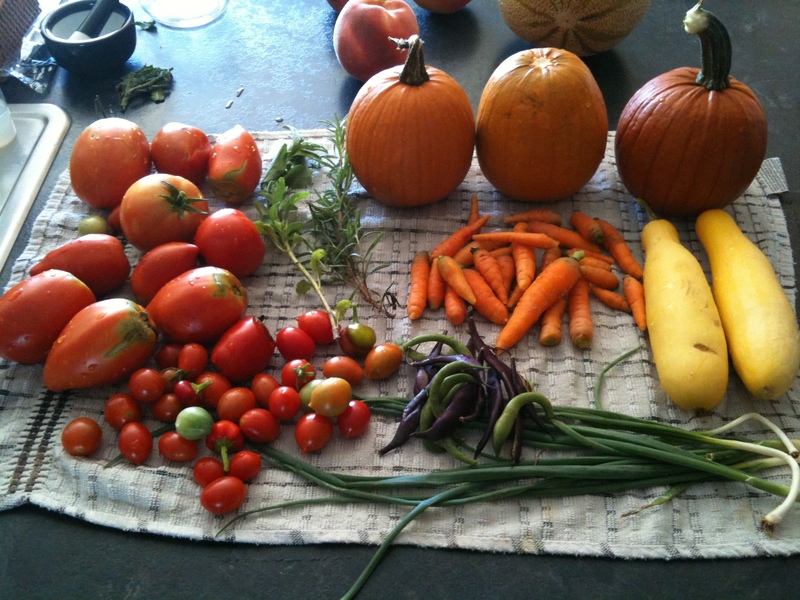 You can see some of the small pumpkins I harvested in this picture. Awesome idea. I love your trellis idea. I want to try this now. Thanks! I look forward to the updates. Perfect information! I have been searching for something such as this for a long time now. Thanks for the tips! This is fabulous! I am gardening in zone 5B – Eastern IA. 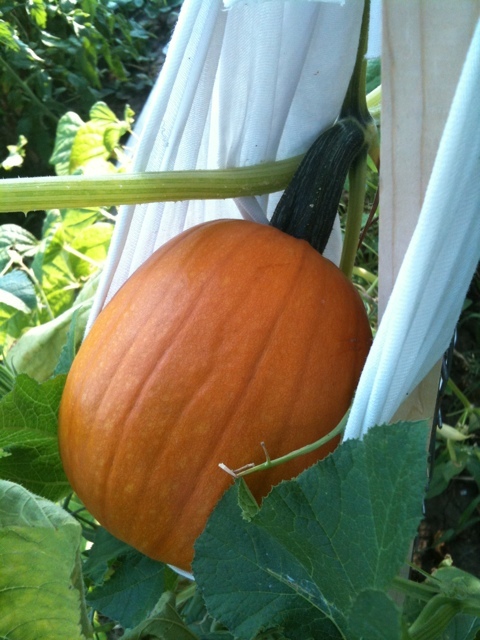 My sugar pumpkins aren’t nearly as far along as your are. I got my garden planted really late and have been battling cucumber beetles hard. Finally lost my cucs, which is unfortunate, because I really wanted to can dill pickles. LOVE your trellis! I hope they don’t get my sugar pumpkins.